(TibetanReview.net, Sep19, 2018) – Tibet’s exiled spiritual leader, the Dalai Lama, has, on Sep 18, concluded a six-day visit to the Netherlands with a meeting with a cross-party group of six parliament members in Rotterdam. And MPs and their parties, have been mentioned as Sven Koopmans (VVD), Salima Belhaj (D66), Tunahan Kuzu (Denk), Esther Ouwenhand (Partij voor de Dieren), Martin van Rooijen (50Plus) and Selcuk Öztürk (Denk). 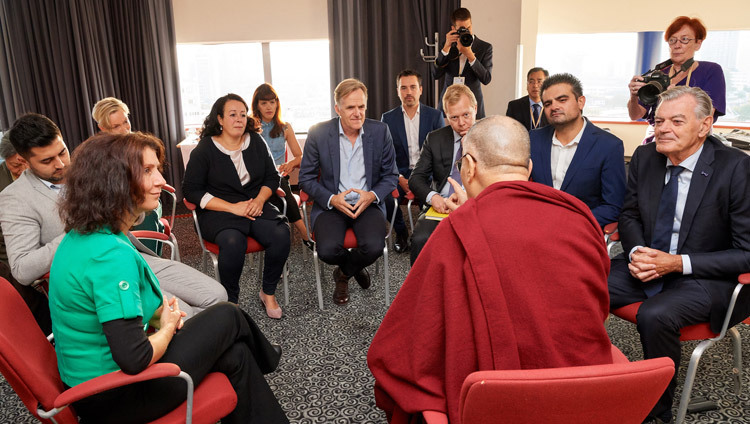 The group, joined by some of their assistants, held a wide-ranging discussion with the Dalai Lama, said the Office of Tibet Brussels which coordinated the visit. The Dalai Lama was stated to have told the MPs that even UN Resolutions on Tibet did not bring any tangible outcome and that the realistic way forward was to work with China. However, given China’s lack of interest to resolve the Tibet issue, the Dalai Lama has said any measure of support by outsiders, including parliamentarians, was crucial. He was stated to have especially brought to their attention the critical situation of the natural environment of Tibet, which shares borders with the world’s two most populous countries. The Dalai Lama has suggested that a parliamentary delegation visit China and Tibet and seek to help protect the Tibetan ecology with the involvement of Chinese experts in the field. His main schedule during the day was stated to be a religious teaching which was attended by over 6000 people. A total of 21,000 people were stated to have attended the public talk and teachings of the Dalai Lama during his six-day visit to the Netherlands while 400,000 had viewed the events’ live streams. Of the surplus of 70,000 Euros generated during the visit, the Dalai Lama was stated to have asked that 20,000 be donated to supporting teaching Tibetan language to Tibetan children in the Netherlands, with the balance going to Emory University for its work on promoting social, emotional, and ethical development.